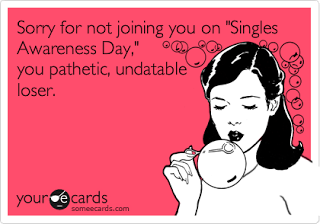 I’m sure it will come as no surprise to anyone that I think Valentine’s Day is stupid. No, these aren’t the rantings of a single girl complaining that it’s sooooooo depressing, and I’m not saying it’s pathetic or a “Hallmark Holiday.” I’m just pretty sure that you are able to show the people in your life that you love, your affection every single day without wasting your hard earned money on flowers that are going to die in three days anyways. – I should probably throw in that I hate getting flowers… honestly stopped talking to a guy because he had flowers sent to me with a card that said “Hope you had fun with camp this week. Have a good day! Chris.” True story, the card is still on our fridge ((my roommate and I like to call it the icebox of shame, where all-of-the-stupid-things-that-guys-I-talk-to-do-or-say are laid to rest)). – My family really doesn’t get my dislike of flowers and my grandmother tells this story of me dumping a guy for sending flowers to all of her church friends… it’s a bit ridic – and absurd that she thinks this is the only reason I cut the cord but I let her find humor in my love life the same way I let you guys, I am of the generous sort, what can I say? My roommate, ladies and gentlemen, i’ve been holding out. I think it’s time to add to the fridge wall stat – I’ve got a month to do it!